Background: Some healthcare organizations struggle to improve quality. Identifying characteristics associated with underperformance may help inform approaches to improvement. Therefore, we sought to: (a) Identify organizational factors associated with low-performing healthcare organizations and (b) propose a conceptual framework with actionable domains, which we present as AMP (The Model to Amplify the Missing Potential), to inform improvement. Methods: A systematic review of qualitative studies was completed on the following databases: MEDLINE (1950–), EMBASE (1946–), Cochrane Library (1948–), CINAHL (1960–), and Web of Science (1996–) through May 22, 2017. Included studies used qualitative methods to evaluate characteristics of healthcare organizations with below-average patient outcomes or quality of care. Data from included studies were abstracted independently and in duplicate and analyzed using framework-based thematic synthesis to generate AMP. Study quality was evaluated using the Critical Appraisal Skills Programme tool. Results: Twenty-two studies (25 articles) from multiple countries (United States, United Kingdom, Canada, Ethiopia) and settings (e.g. acute care, outpatient), with a diverse range of employees (e.g. nurses, leadership, staff) were included in the final analysis. 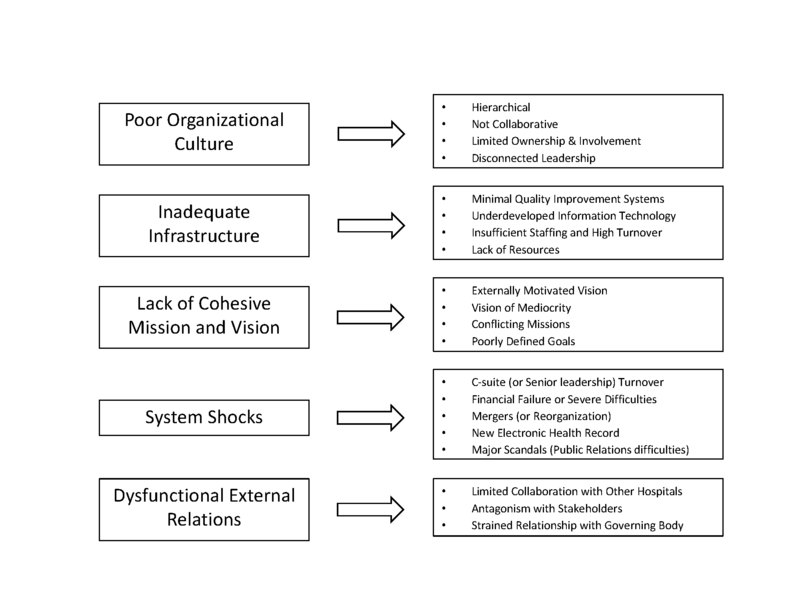 Five domains consistently characterized struggling healthcare organizations: poor organizational culture, inadequate infrastructure, lack of a cohesive mission and vision, system shocks (i.e. 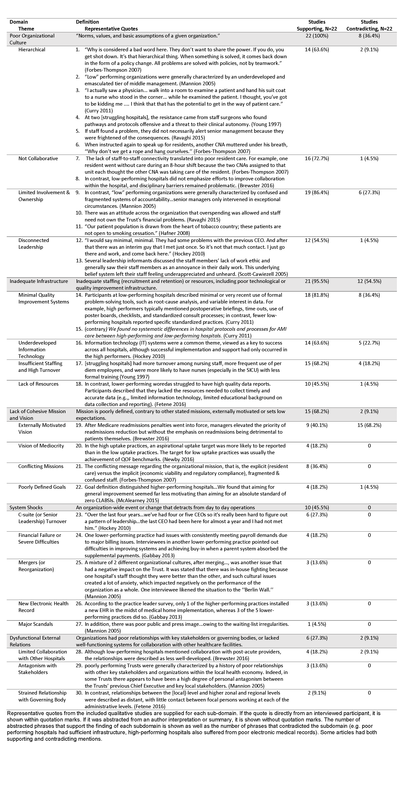 an organization-wide event detracting from daily operations, e.g., leadership turnover, new electronic health record), and dysfunctional external relations (see Table for representative quotes). AMP serves as a model to identify and target barriers to improvement in struggling organizations (Figure). Conclusions: Struggling healthcare organizations share characteristics that may affect their ability to provide optimal care and improve patient outcomes. These domains may be amenable to interventions or systematic analysis when problem solving low-performance. Thus, AMP provides a potential roadmap to anticipating barriers and designing improvement action plans for under-performing organizations. Vaughn, VM; Saint, S; Krein, S; Forman, J; Meddings, J; Ameling, J; Winter, S; Chopra, V. THE MODEL TO AMPLIFY THE MISSING POTENTIAL (AMP) OF HEALTHCARE ORGANIZATIONS STRUGGLING TO IMPROVE QUALITY: RESULTS FROM A SYSTEMATIC REVIEW. Abstract published at Hospital Medicine 2018; April 8-11; Orlando, Fla. Abstract Top 15 Research & Innovations. https://www.shmabstracts.com/abstract/the-model-to-amplify-the-missing-potential-amp-of-healthcare-organizations-struggling-to-improve-quality-results-from-a-systematic-review/. Accessed April 22, 2019.